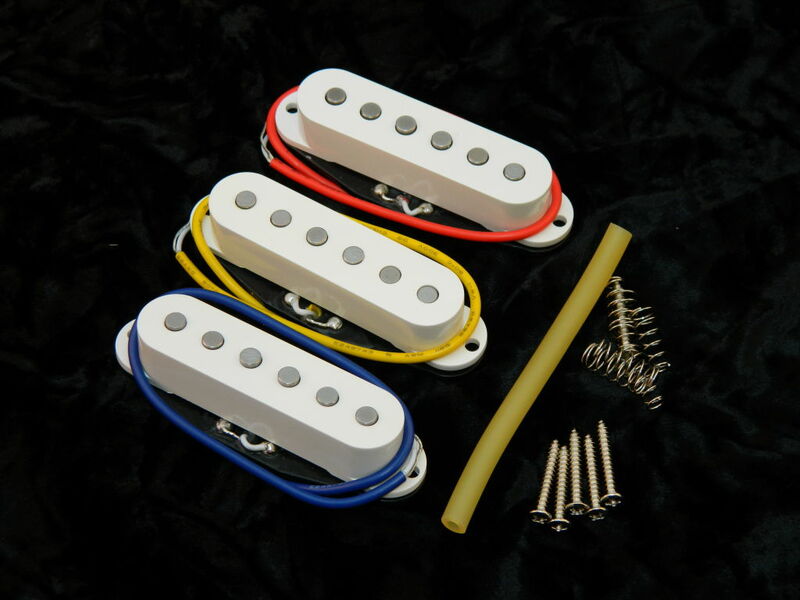 Ironstone’s Strat pickups Platinum set is a combination of higher resistance pickups particularly suited to playing styles that emphasize gritty higher output Blues or Classic Rock tones, yet are still able to produce silky smooth warm Alnico tones when dialled back a little. So if you are after those deliciously dirty SRV Stratocaster tones – look no further! Lightly beveled pole pieces and gloss finish covers add to the vintage styling. The Ironstone Strat pickups Platinum style, feature resistances of an 8.4K Ohm ‘spanking hot’ Bridge and 7.4 / 7.3 k Ohm hot middle and neck configuration, as well as 43 AWG windings (as the Texas Specials). 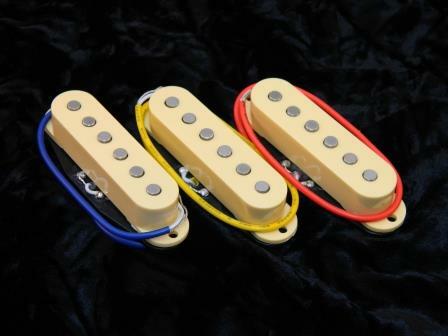 Like all of the Ironstone Stratocaster pickup range, the Platinums share the ‘family’ warm vintage tone set. 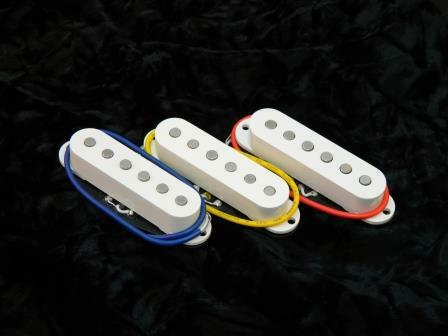 The resistance configuration of Ironstone’s Strat pickups Platinum set means they are at the hotter end of the range. They have a wide dynamic range, which means they are extremely responsive to playing styles. Use some sensitivity and they will rewards you with very good clean tones. Dig in with the pick and you will get an increasingly grittier output. 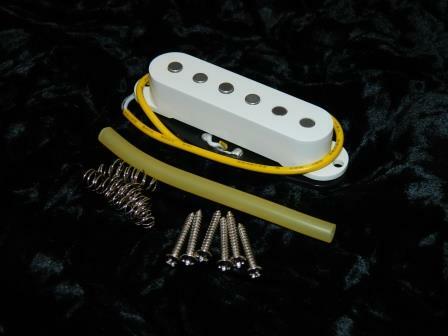 As all of the Ironstone Strat pickups, the Platinums come complete with all required mounting hardware (and are also supplied with a length of latex mounting tubing for you to cut to your own requirements) and colour code wiring identification. Platinum set just fitted to my 80`s Korean Squier strat and what a difference they have made ! The guitar sings and rings like never before,thanks for all your help and advice Tony. 80’s and 90’s MIK Squiers are some of the nicest instruments to play out there. Glad to hear the new Ironstone’s have lifted the ‘stock tone’ to where it deserves to be. 2 Platinum alnico V single coils and a 15.5k alnico V humbucker installed in a Yamaha Pacifica . . . it’s like having a completely new guitar ! I’d lived with the original pickups in the pacifica for a few years but as many will testify they’re somewhat lacking in character so following a bit of research on the net I contacted Tony who provided some excellent and helpful advice. The pickups arrived in France 4 days later and there was no problem installing them thanks to the supplied wiring diagrams. The difference was immediately obvious. Oh yes ! Instead of the rather lifeless original single coils I now have a variety of sounds that are much more expressive and so much wider in range and responsiveness, likewise for the humbucker which blends in very well in terms of overall sound and volume. It’s been a few weeks now since they were installed I absolutely love the improvement. 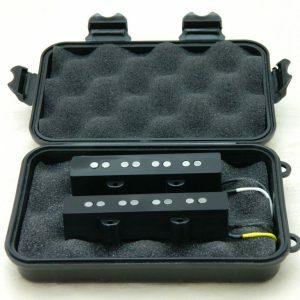 I had been debating whether to invest in another guitar to get the sound I was looking for but honestly, for the very modest cost of a set of these pickups, this was definitely a better choice. I really can’t thank Tony enough for his good advice and excellent customer service from start to finish. Outstanding result and so happy I’ll definitely try the tele replacement pickups next. Cheers Tony, keep up the good work ! Love the way these pickups have improved the tone of my 50’s reissue Mexican strat. They retain that classic 50’s vintage chime but give you a lot more crunch when you crank things up than the Fender pickups did. I have a partscaster build planed and that guitar will definitely get treated to a set of Ironstone pickups too. Looking forward to your next project then Steve! Good customer service. 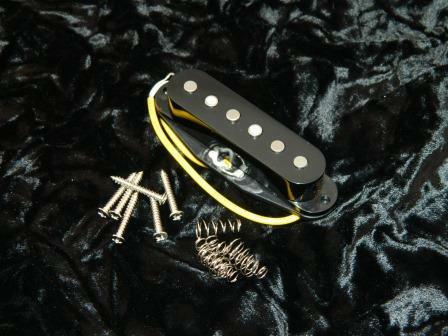 I have finally installed these pickups and am nicely impressed. I went with a .47nF cap. These pickups have a really cutting high end allowing me to hear all the nuances (sliding over each fret, the string tapping against the fretboard, the fingers hitting the strings, etc.). The pickups in my cheap starter guitar are incredibly muddy and bassy in comparison. The Ironstones also sound a bit louder and fuller than a great set of Duncan Designed single coils I have – could be due to higher output and louder mids. They have a lot of bite with the tone fully open, but dial it back a bit and they are clear and glassy for softer music. Very responsive to dynamics. The Platinum’s are arguably the most versatile Strat pup in the range, so thanks for your praise which testifies to that! Hi , just like to add my piece to these reviews, I have built solid bodies from scratch in years gone by and spent lots on pickups etc. Having lots of fun upgrading squire strats for friends and family in the music scene just now. I used the Silver set for the last one and on the strength of the results have just installed the platinums in a Gilmore lookalike for my son. 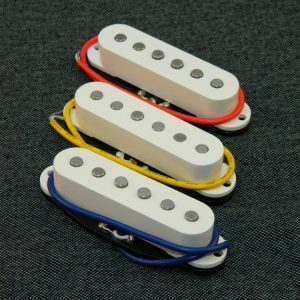 I’d recommend any of these strat pickups as an upgrade for your guitar. I bought a new USA standard Strat a number of years ago from a highstreet music shop and use this as my bench mark. Now the sound of a guitar is subjective to the individual but in my view these pick ups though sounding differant are every bit as good in all departments,subjective as i said,The term often used is great pickups for the price ,(wrong) These pickups are great pickups full stop .but also when you weigh up the cost of american fender pups against the Ironstone pups its a no brainer,so if you swithering on buying any of these sets go ahead youll be rewarded in the end product. ps got a few tele projects coming up and i know where ill be getting my pickups from.cheers. Thanks for the praise Graham, and looking forward to helping you on the Tele projects too. 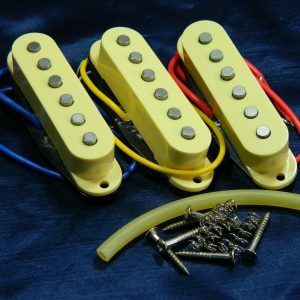 AMAZING…..As a returning customer I would like to congratulate Ironstone on producing a fantastic choice of amazing pickups. They do exactly what they say they do, and are up there with the best. Anyone thinking of upgrading should seriously consider Ironstone…I have just installed a set of Platinums to my ’78 Strat and just can not describe how good they are. Thank you once again. Thanks of course for the praise. 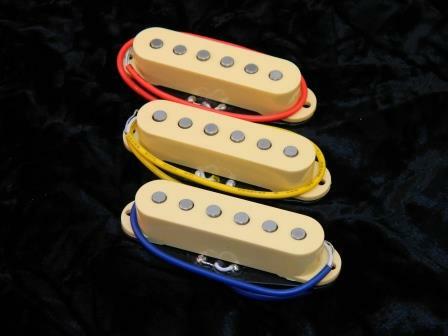 The Platinums (along with the Golds) are my best sellers, the most versatile Strat pups in the range. I finally put my set of Platinums into a Strat copy I got for next to nothing (just to tinker with), and the results are way beyond anything I expected. 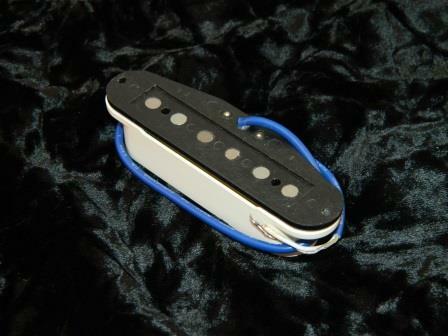 With a new trem block and these pickups, it sounds simply amazing, I can’t put it down. I have my eyes on a cheap Tele as my next modding project, so I’ll definitely be a returning customer. Thank you! Hi Peter, Always love to hear the ‘can’t put it down’ comment! fitted with golden age p/ups all s/c and high quality, so I know what a great pickup sounds like. All I can say is OH MY GOD!! I got the sounds of a top dollar strat and I can’t even face playing my trusty ‘ole Les Paul!!! Your pick ups are truly awesome, thank you but I don’t think I can thank you enough. the difference in tone between mine now and his. 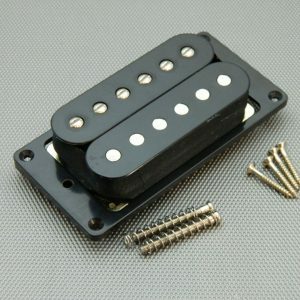 Your pickups are great and so affordable. Keep up the good work. You can quote me on this” (MIM Strat upgrader). “Received the Plats this morning had a busy day so had to wait until this evening to pop them in! “Beautiful set …Meaty lows and defined highs…Real fat strat sound with beautiful defined mid freq and much responsiveness to player’s touch. I installed this set to my 25 years old Pacifica with rosewood fingerboard and alder body… now sounds like a real “texas beast”. “Firstly, I’ve gotta hand it to you, they do exactly what it says on the tin!!! Secondly, why on earth anyone would spend hundreds of pounds on pickups now is beyond me! I started with a ‘P’ serial MIJ Squier with a really fantastic neck. I changed out the basswood body for a new 2 piece alder one sprayed in 3TS nitro by my own fair hand – this made a huge difference to the brightness and depth acoustically. I had been playing the guitar for a week or so with no electrics (or even a guard) and it really sings; the fit, feel everything was perfect. The ceramic pups on those early Squiers always seem to lack definition and get muddy with distortion, so I decided I wanted some alnicos and via ebay found the Ironstone webpage. Having browsed the site and read some fantastic reviews I settled on a set of Plats – who wouldn’t want SRV tone for 30 quid!! 2 days later they arrived. I already had my guard set up in anticipation; CTS pots, cloth wiring, .047uf cap, treble bleed for Vol and Switchcraft jack; the pickups took me all of 10 minutes to install (loving the rubber risers btw). Another 10 and she was back together, strung up and ready to rock. I spent a few minutes getting the height right then I let her have it! 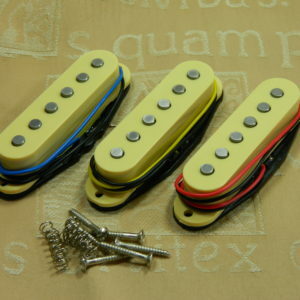 Let me say, cranked up through a clean channel these pickups have balls! Big fat hairy ones! And it isn’t from a distortion stand point, they are just incredibly punchy – it’s as if they rip into the amp and pull the notes out!! Add a bit of dirt and…WATCH OUT!! Then by backing off slightly on the volume and softening them with the tone you find your crystal clears. You can go from ‘Texas Flood’ to ‘Lenny’ just by using the controls on your guitar. 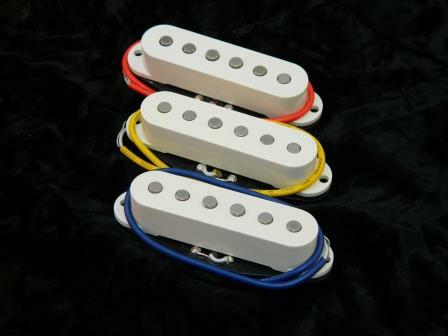 I’m not saying that these pickups will make you sound like SRV but BY GOD do they help. I now have the SRV tone that I’ve been chasing all these years and a guitar that I would put up against anything on or off the market! I can’t recommend them enough and and I’m dying to try out the rest of the range. 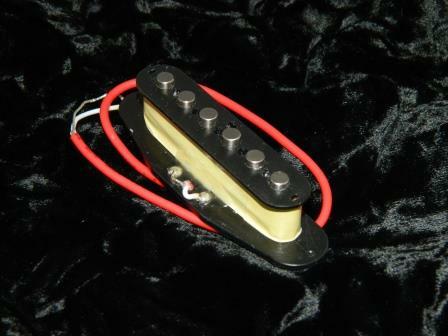 “I’ve finished the “Gilmour” type strat project today using your platinum pickups and WOW!!! What a sound!!! Just what I was after from my Strat! Rich warm tones to beautiful clean to snarling overdrive.. They sound awesome through my Marshall valve amp! So so pleased! I will recommend your pickups to all. I’ve bought pickups in the past that cost £££ more and they’re not a patch! “Received and installed in a great playing standard Squier strat, only let down by thin sounding indonesian pickups.